First off, there was a large earthquake on the South Island of NZ last night. We did not feel it. Thank you all for your concerns. New Zealand has had a heightened number of quakes this year, and I’m sure there are many more to come while I’m here. I am aware that everyone is concerned. If anything happens, remember that I have my check-in on my “Where’s Wired” page and I’ll be sure to post on social media once I have service to let everyone know all is ok. It was very kind of everyone to check-in and I’m sorry if I didn’t reply to you all individually. As expected, we all woke to a field of condensation and wet tents. It wasn’t the terrible kind that soaks everything, but all our tents were pretty wet and sleeping bags were damp. 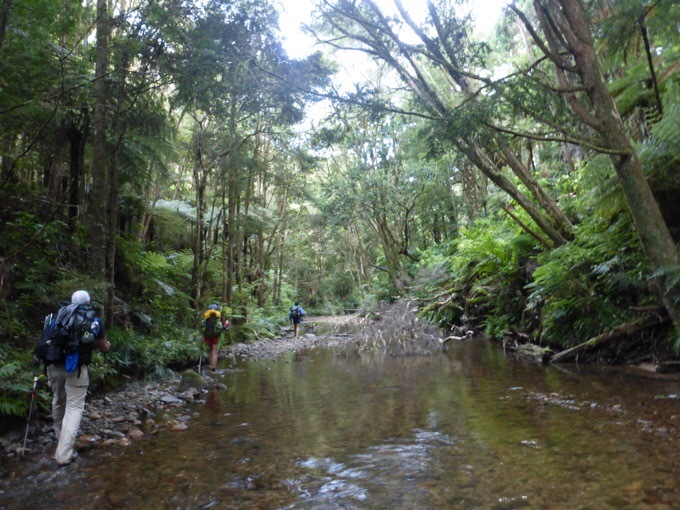 We headed out at 7am and soon were in the 3km Papakauri Stream walk. 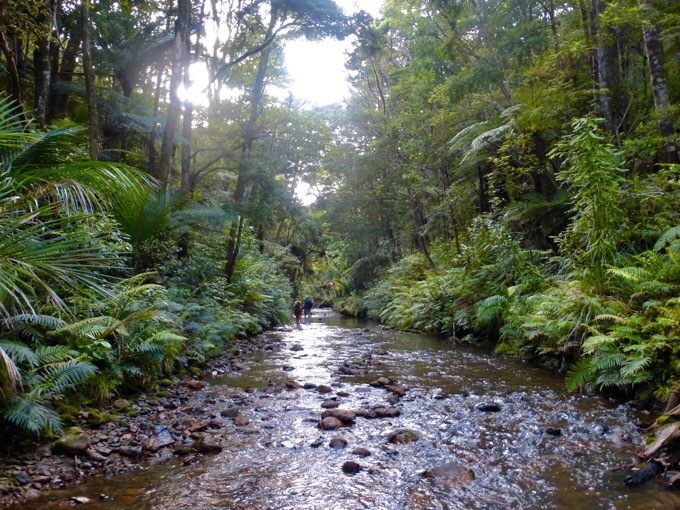 It was about an hour of wading down the stream that had slippery rocks along the bottom. 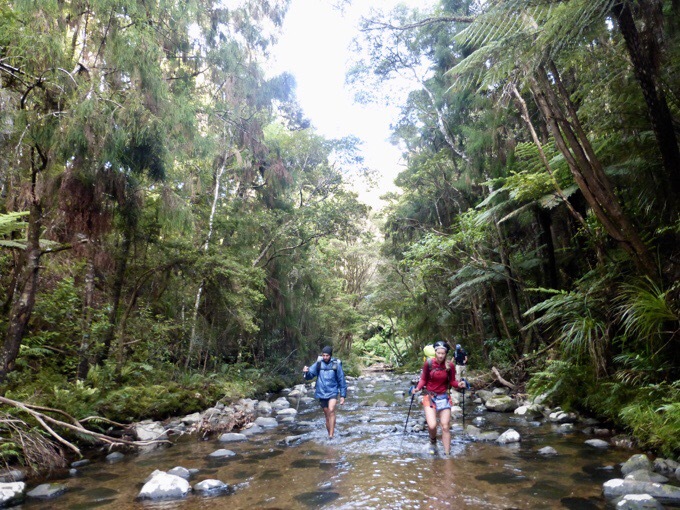 Hiking down the Papakauri Stream. Not far into the stream walking, we noticed that there were faint side paths every so often along the side that went up on the bank for awhile and then dropped back to the water. They seemed to help avoid the deeper parts of the stream. Some were well marked with an orange TA triangle, some had an orange ribbon, and some weren’t marked at all. Early on, Felix went up one to see if it was a game trail or actual trail. He yelled down that he wasn’t on a trail, so the remaining three of us continued on down the stream. Felix never dropped back down to the stream and we figured he was doing his own thing, which he likes to do, and we didn’t see him again in the stream section. The brushy trail off the shore of the stream. As soon as the section of wading was over, we came to 12mi/19km of road walking. The first 8.5mi/14km of it was a paved highway walk with little to no shoulder. Yep, more highway walking. There is a ton of this on the North Island, and I’ve expected it, so it hasn’t been a surprise. It’s a morale killer for some, but for those that knew to expect it, it’s just another part of the trail. We saw on Guthook’s App (love it!) 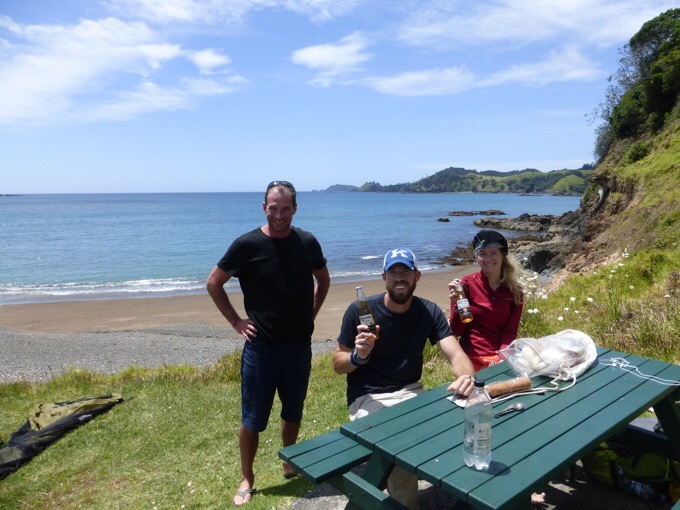 that there was a beach with a picnic table at the 7.5mi/12km mark, and it was just the carrot we needed to keep a good pace and make it for lunch. All three of us put in our headphones. I used the pocket app to listen to a couple online articles I’d saved. I listened to the lengthy blog post that Anish (an awesome female thru hiker and record holder) wrote on her recent self supported record of the Arizona Trail. It was fun to listen to a full thru hike of the AZT all on one go, and it was motivating to hear the details of a successful self supported record attempt while hiking myself. Just yesterday, I convinced Becky to buy headphones for these long road walks. She likes heavy metal music and listened to that on the road walk. It was fun to watch as she put the headphones in and took off like a bullet setting a great pace on the road. Will has a sports podcast he enjoys and listened to that. After a couple hours, we arrived at our lunch destination. It was great. There was a picnic table, a beach with a nice ocean view, and some tourists there with camper vans. Not long after we got there and laid out all our tents to dry while we ate, a man from the US came over and offered us cold beers. I don’t drink, but Will and Becky were happy to partake. Trail magic again! A man gave Will and Becky each a beer at lunch. After a nice lunch, we continued on to another 4mi/7km of road walking. 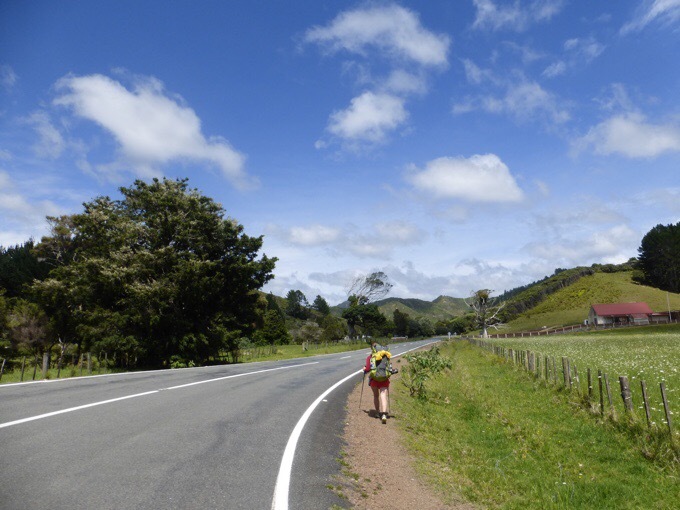 We’d been in touch with Claudia, who roomed with us in Kerikeri, and thought we might catch up to her today. She said she ended up having bad blister issues on the road walk after the water yesterday. A nice woman saw her limping and offered her a place to stay for two nights, so Claudia is resting her feet. I messaged her that she should come out and bring us some trail magic on the road walk. After lunch, we got a message from Felix that he had run into Claudia who actually did try to surprise us with some trail magic! We had already passed, but she had brought cold soda, bananas, and gummy worms. Oh man, so close! We were bummed we missed it. Thanks for trying Claudia! Apparently, it didn’t go to waste as Felix and another hiker we all know came by while she was there. The 4mi/7km after lunch was a long winding uphill past many farms. The road changed to dirt and gravel, and was much better to walk on. The top of the climb had one of the best views of the hike so far looking back on the green rolling hills and the ocean. It was cool to look back on where we came from and get a nice rewarding view. 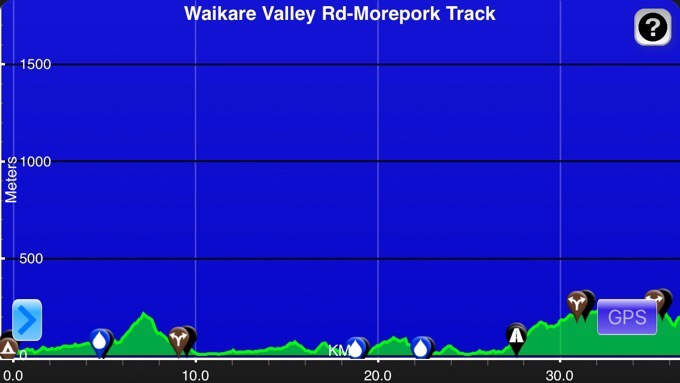 We got to the Morepork Track at 3:30pm. We knew we had just over 3mi/5km left to our planned camp spot, and worried this wooded section might be slow going like the previous forests last section. Thankfully, it wasn’t and it only had steeper ups and downs at the end. By the time we made it to the top of the climb that had our camp spot, we were happy to be done for the day. It was a full day and we were all good and tired. The Guthook App is great at giving suggestions of possible camp spots, but you never know what you’ll get as far as how quality the spots might be. It basically lets you know it’s campable, which is great to know on a trail like this. It said there was a view, which is sorta true. If we walked a bit, we could see the ocean a bit, but I had hoped for more of a view. The important part is that it’s well sheltered from the wind gusts and the small chance of possible showers overnight. Our grassy campsite. My tent is in the trees. Tonight is the night of the closest (and largest) super moon for forty years or something like that, so we aimed for this spot to get a view. 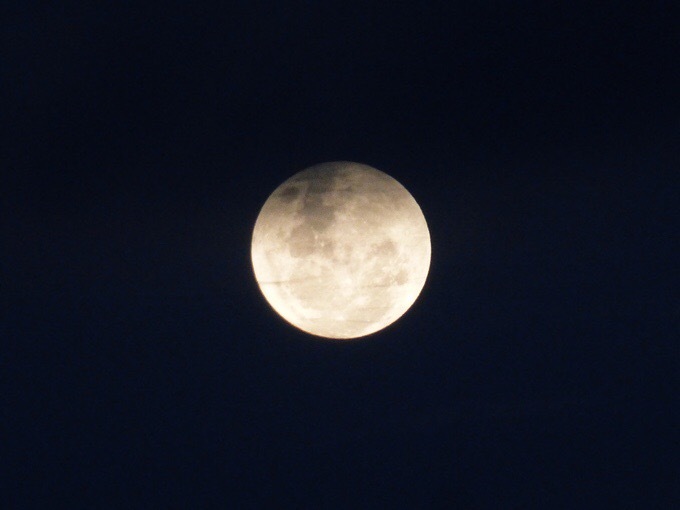 With a chance of rain tomorrow, there are clouds in the sky, but fortunately, they thinned out and we were able to see the moon, which looked like…well, a big moon. I zoomed in the best I could with my point and shoot camera and got an ok shot. It was nice to be able to see it. Felix arrived as we were having dinner. He’s more of a solo hiker and this may be the pattern of seeing him on and off as he does enjoy having a group to check-in with. We looked ahead to tomorrow and saw that there was another freakin’ $10 boat crossing and $15-$25 camping or cabin options. This trail is killing our bank accounts! It keeps going into towns and limiting camping options. I feel like half my spots have been paid for and half have been in an actual wilderness. It’s a killer for morale for us to not be able to just hike and not worry about timing and where we might land. Tomorrow, it may rain, and we aren’t sure how difficult the terrain will be, but there are two options. Do a short day and pay to camp at a place with no electricity (I need to charge) before town and then do another short day waiting for the 3pm boat ride and find a plug in town…or push a quicker pace to make it to town tomorrow night, resupply, and make the boat ride where there is a full Caravan Park and the option of paid camping or an indoor cabin if it’s a rainy night. I’m wanting to push, but everyone else is hesitant given how tough today was to make miles and it was an easy road walk. We decided to give it a try and we will wake up an hour early to at least allow for the possibility of making it to town and doing the boat tomorrow. In the end, it would mean the difference of half a day given the timing of the boat and we can sleep in and relax the following day at a place with showers and electricity. I hope it’s smooth walking tomorrow and don’t want to push the others to exhaustion. They are definitely hesitant and worried about making the miles and possibly wearing themselves out. I understand that, and we will just see how it all goes tomorrow. I’m happy they are willing to get up early to at least allow for the possibility of making it happen. To make things even more confusing. My friends that did this hike in previous years don’t mention taking a boat. We all loaded what we thought were the most recent tracks, maps, and trail notes off the TA website before our hikes, but Becky’s maps show a road walk around the bay instead of the boat. Ours shows a road walk after the boat. So, it’s almost the exact same mileage, but it’s tough to decipher which is the “official route.” The trail notes word it in a way that the boat is the official and the road walk is the alt, so that’s what we decided to go with. The pain is that it’s the boat that has us having to push, and if it didn’t exist, we could sleep in tomorrow and leisurely hike with no worries of timing. Ugh. We’ll see how it goes. Ok, time to sleep. The wind is blowing through the trees and it’s great that we’ve found a good spot protected from it for the night. Once you realize the scale of the earthquake devastation that lies ahead of you, you will understand all the concern of your “friends” and family. Wellington was hit hard and as far as I remember, that’s on the North Island. You will likely be feeling the impact of the quake in some form or another throughout your entire trek, so it’s probably a good idea to check ahead as you progress further South. Also, as someone has already mentioned, the economy in NZ is tough and all the complaining about paying for campsites, ferries, and huge chunks of data, could perhaps be worded in such a way that, while still being informative, didn’t make you out as someone who thought to skate through these towns purely on “trail magic” and the good graces of others. You are walking along miles of roads for reasons well beyond your determined interests. These roads link rural communities and towns together. They link workers with their occupations… occupations that often times involve tourism. You should have had plenty of time to meditate on this while you walked them, even with your preoccupation with podcasts & audiobooks. Despite my tone here, I have really enjoyed stumbling upon this blog. It has provided some interesting terrain beta thus far. However, behind every good writer is also a personality, and having not read any of your earlier stuff, I’m still trying to figure out who this “Wired” character is. Right now, I’m kinda digging Felix’s style…. but Felix isn’t blogging, he’s HHOH as you are. It’s a curious thing to me, these seemingly conflicted ideas. On one hand you are genuinely surprised & relishing your newly found international community of like-minded friends as you all brazenly buck the established systems and head into the unknown wilderness (I use this term relatively, speaking) but on the other hand, oh the plague of lacking bandwidth & not being able to Skype or download the latest episode of TV! Ha! Weave on wired one. Weave on! I appreciate being invited along for the journey… in so much as this open forum serves as an invitation for anyone with similar interests. Please don’t take my constructive criticisms too harshly. I hope instead that you can use them to forge a greater appreciation and understanding about the land that you tread upon and the people you tread amongst. 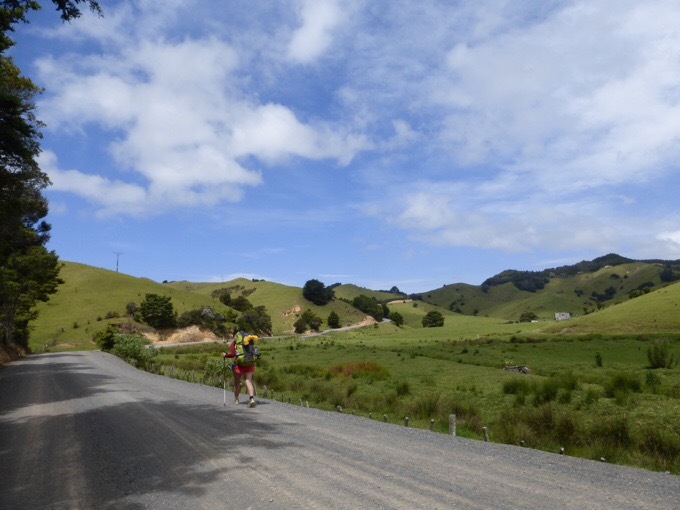 As you and many others have mentioned, on the whole, New Zealanders are exceedingly kind and generous people, perhaps, during some of your resupply forays into their villages and communities, you might glean a little history about the place and add this to your blog. It might help to pave your way ahead… karmically speaking, or otherwise. Those of us who have followed Erin on her many long hikes over the years expect to hear her honest opinion on what she encounters along the way. She has never been anything but truthful, never hurtful or malicious, always thoughtful and considerate. I for one look forward to her comments as I hope to follow in her footsteps in the future. Keep it coming Wired! Erin, I was surprised you did not feel the earthquake. have some alternate routes this year! The internet in certain areas may not be working for a while. If you brought your MP3 player with FM radio you can listen to radio New Zealand on FM for the latest emergency information. 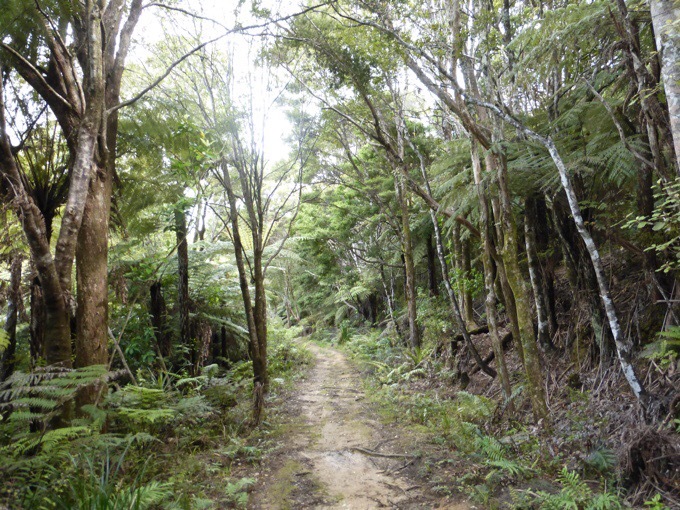 Looks like you are hiking through lots and lots of greenery – too bad alot of it is on roads but the pictures show beautiful scenery. Keep on keepin’. I really enjoy your blog Erin but not so much the cost complaints. NZ is a beautiful place and the locals are good easy going people not to mention the best neighbours a country (Aus) could have.. Things are pretty rough in places down on the south island at the moment. I can only be honest about it being really expensive and I want everyone to know what to expect out here. I would be remiss if I didn’t mention it as I am fully open about all my experiences. Both the good and bad aspects of the trail. Things must be really cheap back home. The prices you mentioned are not high for this end of the world. An overnight camp site with no power can cost you well over $50.00 in one of our (Aus) national parks. But you do get a hot shower and flushing toilets. For god sake get a grip. 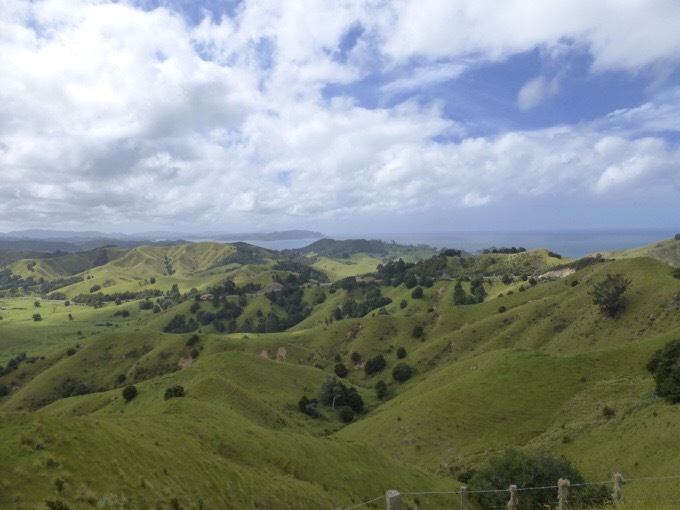 Erin is allowed to talk about the cost of her hike without it being taken as an affront to the national dignity of New Zealanders. 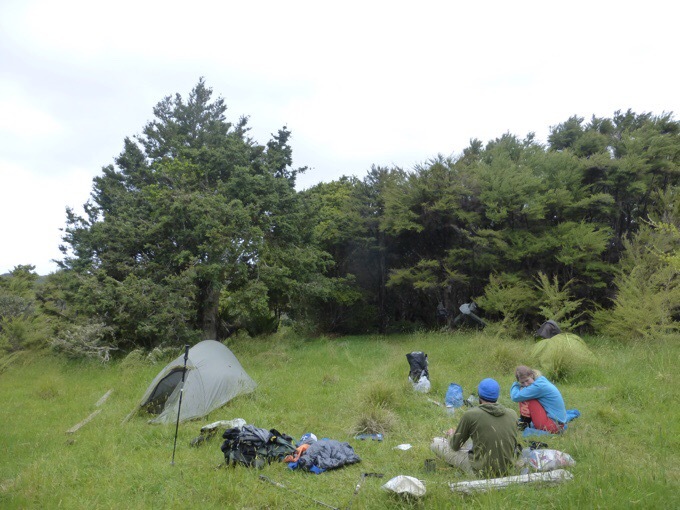 I am also sceptical of your claim that you have paid “well over $50” to camp in an Australian national park – where? Thank you Steve. I think it may have just been poor timing as this was written before I knew about the quake and I added the first paragraph later without realizing how it may have reflected given they just suffered such a disaster. As for Neil’s comments, I will say that, in general, as a thru hiker, camping has usually been free outside of national parks and it’s quite the adjustment for all of us out here to have needed to pay for 50% of the nights out here. I’m very used to wilderness and camping away from civilization, which is a big reason why I thru hike. If I wanted to be in a Caravan Park every night, I’d be in my car driving like the tourists and that’s how this feels right now, so I must warn others and be honest that this is not a wilderness thru hike up north, but more of a bunch of day hikes carrying a pack from Caravan Park to town and then to another pay only campsite. Quite a different and pricey experience from other thru hikes for sure. Some enjoy the facilities of a paid site, but other options for thru-hikers out here for solo time in the wilderness just don’t exist thus far, and that’s been building over the last two weeks, so I mentioned it. I’ll do better to mention it more tactfully I guess. Sorry the phone submitted my comment before I finished with it. After reading the other comments I just wanted say something positive, so thank you for the blog I’ve followed you since the PCT. The first thing I did after hearing about the earthquake was check your where’s Wired page to make sure we’re ok. Good luck on the rest of the trail and stay safe. Thank you:) I should have worded my thoughts better. And yes, that is what that tab is for and thank you for letting me know it worked for you to be able to check that. I’m sorry that came off so abrupt. I have reworded it better. It was a knee-jerk reaction similar to how I get in crowds. I just felt overwhelmed, anxious, and exhausted by it all, so I pushed back. I did not intend for it to come off unappreciative. Quit moaning about paying for campsites. NZ doesn’t need freeloaders like you. freeloaders??! isn’t it a basic human freedom to camp in nature? we met (briefly!) in between the first and second Northland Forests. It’s been interesting reading your updates and reading about your encounters with other hikers that I have also met. Me and Chris are currently in a hotel as i have a bad knee injury (from the 90 mile beach…stupidly i pushed on through the forests). i don’t know how long i’m going to be stuck resting here!! It’s a good job that me and Chris gave ourselves six months to complete this trail! Oh hi Lisa! I heard about your knee and was bummed! Good to know you have time to let it heal and I wish I’d gotten to know you two more. That damn Ratea! Justin please stop. I believe the intend here is to inform future hikers so they can budget accordingly. It is very unsettling to find yourself thousands of miles from home facing unexpected expenses. A $10.00 here and a $20.00 there really adds up while doing a long journey like the TA. Thank you Nicole! I took care of the trolling which happens sometimes on the internet. Yes, that is exactly what I was trying to say. I probably should have mentioned that there has been an extra expense like that almost daily and it would have been in better context. Wow, sorry to see such scolding and a big of trolling here. When I started following blogs, you’re included, I came from a place of reading books by thru hikers from times without cell phones and devices. Just a different experience. Not better, or worse, just what was possible at the time and could still be an option. I appreciate your blog for the immediacy of it all. Your replies.. NOT required to reply to each one, but enjoy the back and forth with the whole group. Feedback is good for hearing how you are coming across. That includes how the Justins come across. Luckily I have several Kiwi friends I have met in person and can judge based on knowing them. I think people were worried lost quake because of tsunami concerns and seeing that some areas were isolated, phone and fell services down, roads buckled. Plus my friends had described the experience of the big quakes near Christchurch in 2011, and less from hundreds of aftershocks. I do get that extra texts, messages and so forth could strain your tech budget. The main thing is you are fine. I am sure we will head more as your bike continues south. I now see SO many places this new tablet changed my words..
Bottom line, I’m with the majority here, especially the comments that followed mine..
We are quite happy with you as you are (and as you keep broadening your experiences). Keep up the telling things as you see them and keeping it real. Good news is that the stranded cow family was rescued. They especially needed water! Sadly their pasture was on the fault line and a number of cows were killed.. some calves which has caused anxiety amongst the survivors. Please let the Te Araroa be the Te Araroa. Adapt to the culture. 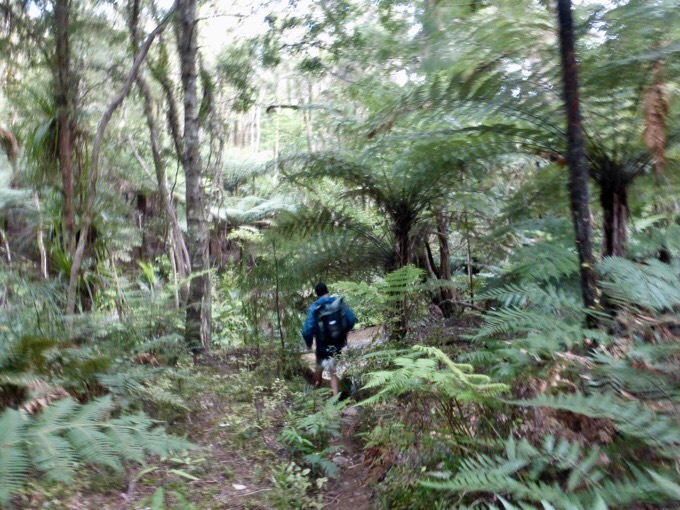 The Te Araroa is not the PCT. I hope it stays that way. Yes, it’s more expensive. No, I wasn’t thrilled about that either. But I flew there knowing that. Twice. I fear that the more American thru hikers go there, the more they will demand it conform to American trails. The TA intentionally goes thru towns. Diversity is good. 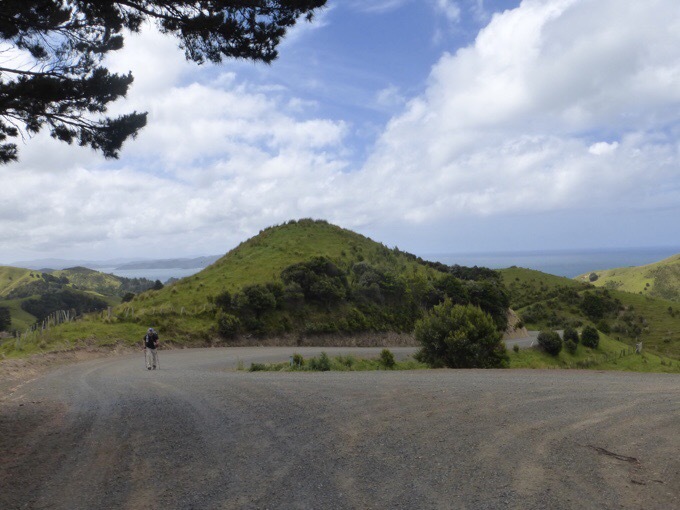 FYI, When you get to the Queen Charlotte Track, please know that it only exists because of the 8 families who live down the ridge along the Bay. They gave up prime property to make that trail possible. the TA “uses” the QCT…not the other way around. There is a fee to walk it. Rightly so. You can buy the pass in Picton. If you walk it and see hand carved benches (beautifully done) and if you notice that brush is cut back…that is largely because of Charlie. He hand crafted the benches. He is an America married to a Kiwi. He is a former boat captain from Alaska. He took me in for a few days over News Year. It was the best part of my trip. His now Kiwi wife literally washed up on his backyard beach in her kayak during a surprise storm. It’s how they met. And yes, folks, freeloaders are a problem in NZ. And people who point that are not trolls. Take the time to learn the differences between trails and why those differences exist. It’s funny that you mention American thru-hikers as the problem when I’m quite the minority out here and we are all expressing the impact in the pocketbooks. Yes, all trails are different, but there are different strokes for different folks and people can have differing opinons without either being right or wrong. Just an opinion. All of your blogs have great information that I’ve used on section hikes in the past. I appreciate all the details and think you are doing a great job. Very entertaining also. Thank you. I’ve read ALL your posts so far, and I believe this is my first comment! I just wanted to assure you that you are NOT coming off as spoiled to me. You are not at all the type to rely on trail magic to sustain you, and that comment was completely unfair. I think you sounded very honest yet cheerful in your descriptions of the beach and the muddy forest. You are a VERY experienced hiker, and so you are honestly able to compare this hike to others that you have done. I’m not getting the feeling that you are complaining but you accepting things as the reality that it is. I enjoy your straightforward perspective. I´m happy you mention the prices and certainly don´t take is as a kind of “How to be a freeloader in NZ” guide. Seems somebody might not be aware that these costs really add up over 4-6 month and can be prohibitive in total, especially if one doesn´t come from a rich country. Also, as we´ve had a fair share of floods (the worst inundating 1/3 of the whole country) I understand how stronly people in NZ feel about the earthquake. What I don´t understand is the need to use vulgarisms, though. Wow. Odd that suddenly so many trolls appeared in your comments. Or maybe you usually are able to weed them and their comments out before I see them. Do not change your information, style or who you are, please. We read your blogs for honest information from a real person. The entertainment of your quirky personality is what keeps us coming back though?. I don’t feel anything you wrote came across negative. Yeah, it’s seriously only one out of every 100 or more comments, and I tend to catch them quick, so that’s not a bad amount. Erin, I have been following your adventures for four years, and I enjoy reading about all the good, bad and annoying sides of thru hiking. It’s not off putting in the least, in fact it’s informative and real, as it should be, it puts the reader right there with you. You expose the Trail, your feelings and challenges honestly, warts and all. You do justice to the reader and gain their trust writing this way. With every entry you prove yourself as a good traveling companion, and point the way down a well lighted path for all to see. Sounds like the troll might have been a disgruntled someone making their living off of tourist’s dollars. It also evaded this individual that in this post you were also speaking for the group and their collective concerns, which I admire you doing seeing that your preference is often to hike alone. You are the kindest person, it shows with the way you responded to this individual and we appreciate the fact that you give all of us the chance to experience each trail with you. Even the good the bad and the ugly. Keep doin’ what your doing, don’t change a thing. Hey Wired, I don’t think you sounded negative or complaining etc. I like all the details; gives me an accurate idea of what the TA is like and makes me think about what choices I would make if I were hiking. Keep on being you. So many defensive ppl out there, sheesh. Regardless of the unwarranted criticism, and this applies to all in the hiking community: You gotta hike your own hike… Good words to live by. HYOH. This is Erin’s normal commentary on hiking, wherever she is at. She has been respectful and informative in Australia and New Zealand. Before commenting otherwise, take a look at her many years and thousands of miles hiked. You’ll see a person you’d like to get to know, really. She has contributed greatly to the hiking community on a national and worldwide scale and you’ll see that with the great many hikes shown at the top of this blog. Erin, you know we love you. So, Go!Wired!Go! I’ll join in the chorus of people who appreciate your reporting it like it is. Maybe those criticizing you have never been to North America and don’t realize how different it is to hike here than in most parts of the world. I think it’s safe to say that we view backpacking trips as a way to get away from towns, roads, and civilization in general. With our large amount of public lands both in the US and Canada, we can avoid paying large amounts at a private campground for a small spot on the ground and hot running water. I’ve never been on anything longer than a 2 week trek, but I prefer camping in the woods by myself to established campgrounds, and it’s what I expect when I go on a backpacking trip. If I didnt, why would I be out there in the first place? That sort of hiking is what I am used to, and it is a cheap vacation from work, the cost to get to and from the trail head plus $6 per day for food. While I doubt I will ever hike the TA, it is important for me and anyone who is contemplating a hike of the TA to know that this will not be a through hike as we think of it in North America. You are only reporting the facts. Are these complainers worried that people won’t come if they know truth? Would they prefer that hikers from other countries be ambushed by unexpected costs? Once again keep up the flow of info and enjoy your hike. Yep, my view as well Mike. It’s just not the same and not the idea most have of a thru-hike in the wilderness. There’s a reason I haven’t done the Camino, but at least it advertises more honestly and people know what they’re getting into. 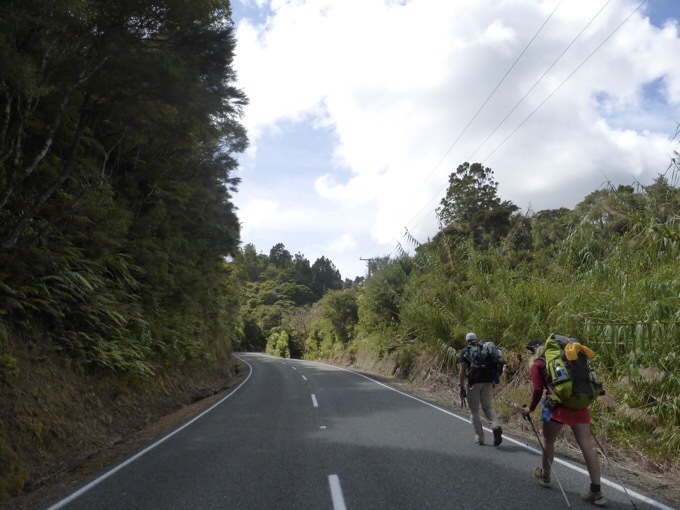 Most here seem to have stumbled on the TA through the NZ tourism sites and feel somewhat fooled.